This module keeps track of login attempts to your site. Please note that there are solutions much better for tracking general site usage available -- such as Google Analytics. This module isn't intended to replace those, it just offers slightly closer integration with specific ProcessWire features. Copy whole directory (ProcessLoginHistory) of this module to your /site/modules/, go to Admin > Modules, hit "Check for new modules" and install module called Login History found under Process heading. Process Login History Hooks will be installed automatically with Process Login History. Note: this module requires ProcessWire 2.2. Automatic cleanup feature requires LazyCron module, which is included in ProcessWire core distribution. Automatic cleanup isn't required for this module to work but it's highly recommended to avoid cluttering custom database table used by Process Login History with unnecessary / unwanted old rows. During install a new Login History page is created, placed by default under Admin > Settings. From there you'll find information about each login attempt since this module was installed. Clicking more link at the end of each row reveals more information about this particular login attempt / user who initiated it. Please note that there are much better solutions -- such as Google Analytics --for tracking general site usage. This module isn't intended to replace those, it just offers slightly closer integration with specific ProcessWire features. 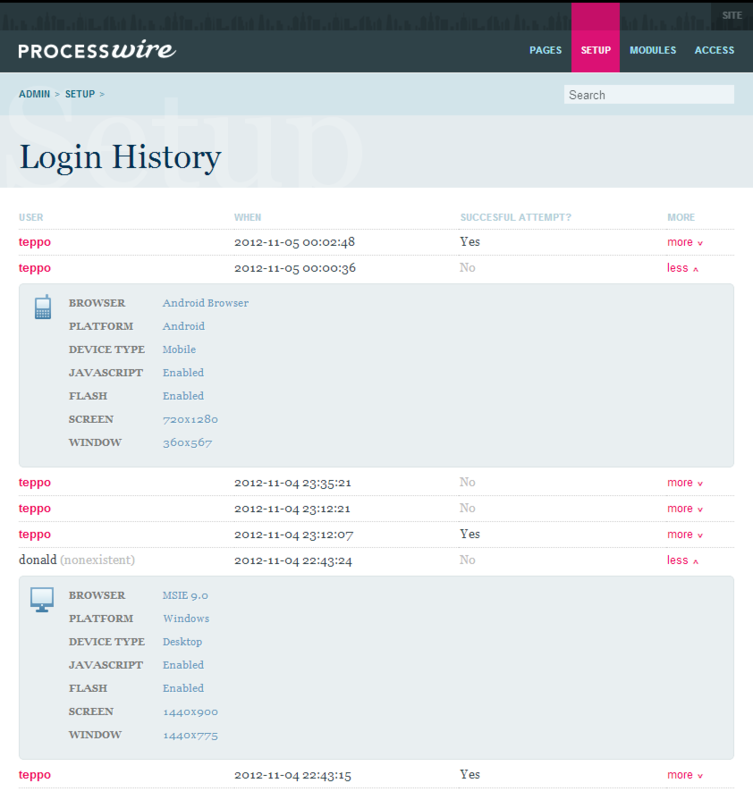 This module is installed just like any other ProcessWire module: copy or clonethe directory containing this module to your /site/modules/ directory, log in, go to Admin > Modules, click "Check for new modules", and install "Login History". Process Login History Hooks will be automatically installed along with the mainmodule Process Login History. Installing Process Login History RSS is completely optional: if installed, it provides you with a publicly viewable RSS feed of the login history. More details under heading "Login History RSS feed". When you install this module, it creates a new page into the Admin calledLogin History (Settings > Login History). This page contains a list of login attempts to your site since the moment this module was installed. By clicking the more link next to each row reveals more information about that particularlogin attempt. In order to access the Login History page, users need to a) be authenticated andb) have a role with the "login-history" permission or have the superuser role.While the login-history permission will be added automatically when this module is installed, it needs to be given to any applicable roles manually. This module provides two types of RSS feeds: one that can be accessed only byauthenticated users via the Login History page (/setup/login-history/rss/), and other which can be enabled by installing the optional Process Login History RSS module, typing in a key to it's config settings, and accessing the feed via URL such as this: http://example.com/process-login-history-rss.xml?key=1234567890. Since the latter feed can be accessed via a public URL, please make sure thatyour key is as difficult to guess as possible (and never use key 1234567890). If you are unsure about whether you really need this feature, please leave the Process Login History RSS module uninstalled. Defines how long history is kept before being removed automatically. Please note that automatic cleanup requires LazyCron module! Defines if attempts to login as nonexisting users should be logged. Key required to view the public login history RSS feed; if omitted, the feedwon't be available. Please note that the key has to be at least 10 characters long.